I have been seriously craving cheesecake. Not plain cheesecake but pumpkin cheesecake and peppermint cheesecake. What can I say- 'tis the season! 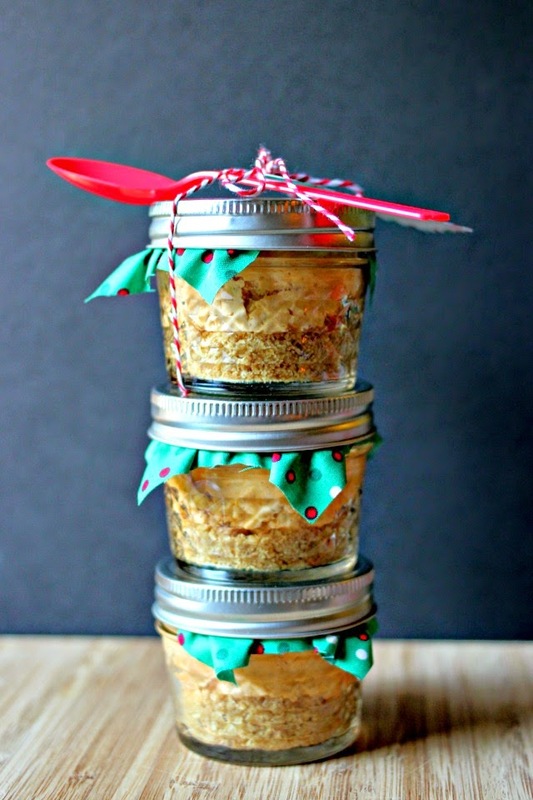 I was also thinking how cute it would be to make mini cheesecakes in mason jars and give as gifts to my neighbors. However, I have a wee bit of a problem. I melted the lid of a Pyrex baking dish all over the inside of my oven. ALL OVER IT. I have a small kitchen in my apartment and my apartment has been adapted for persons with disabilities, which is great because of my daughter but due to the adaptation, I have less cabinet space (counters were lowered and underneath the sink is open for a wheelchair to fit under. So... I have to store some things inside my oven when not in use. See where this is going? Ha. One day, I decided to bake something in the oven. Cleared out all my pans. Turned the oven on. Put my food in the oven. Smoke alarms went off and a terrible smell enveloped my apartment. I ran, turned off my oven, pulled my food out and saw it was covered with liquidy, plasticy, blue stuff. I missed my cake pan with its lid on the top shelf. It was a HORRIBLE mess. I spent ALL night cleaning it up BUT there are still spots of blue that I keep finding and every time I turn on my oven, I smell the plastic. Needless to say, I am not using my oven. It's all crockpot, stove top or no-bake items these days. I have only made cheesecake you have to bake and I just KNEW there had to be an easy way to make it without baking it. Well. Well. Well. Yes, indeed. These are incredibly easy to make. I like easy. You like easy. We all love easy. However... these don't TASTE EASY! Whoo! They have yummy graham cracker crusts. Cheesecake filling with Philadelphia Cream Cheese and Cool Whip. Top with Cool Whip. Garnish with cinnamon or drizzle caramel on them. Put a bit of Christmas-y fabric over the lid, and put band on over it. Then you can tie some baker's twine with a tag and a spoon around the little jelly jar and give it as a sweet gift for someone sweet! 8 ounce package of Philadelphia Cream Cheese, softened. 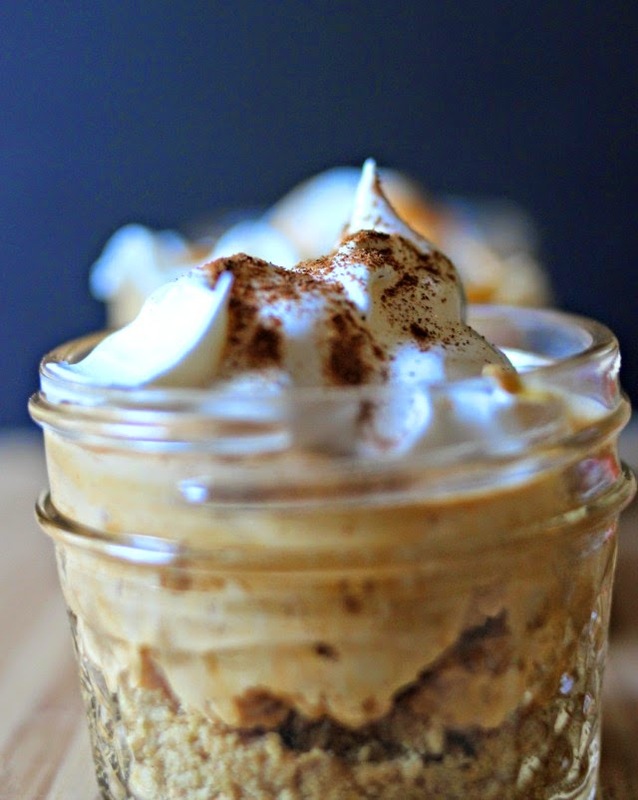 1/2 packet of pumpkin spice flavored instant pudding (3.4 ounce box. If you can't find it because it is a seasonal flavor, use vanilla instant pudding and add 1/2 tsp or so of pumpkin pie spice). ground cinnamon or caramel sauce. 1. 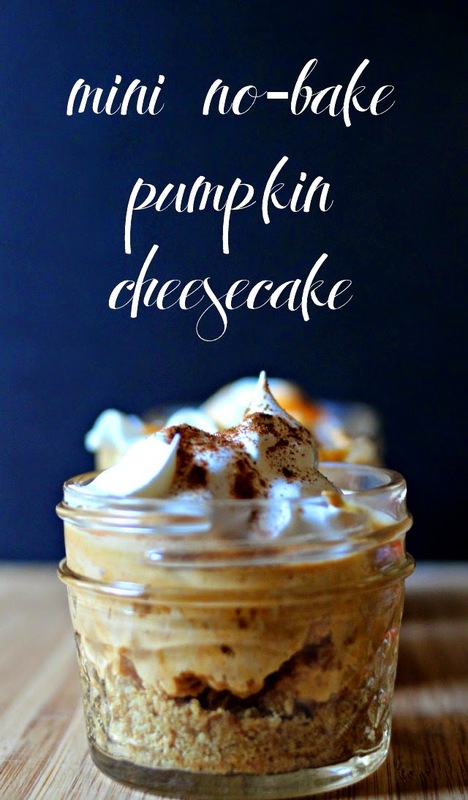 With a handmixer in a large bowl (or you can use a stand mixer if you have one), mix the cream cheese, pumpkin, brown sugar, maple syrup and pudding until well blended. 1. Use a food processor to make the graham cracker crumbs or manually crush the graham crackers in a large zip lock and whatever weapon of your choice- rolling pin, hammer, meat tenderizer, etc. 2. Put crumbs into a bowl and add melted butter until the crumbs are starting to stick together or look moist. 1. 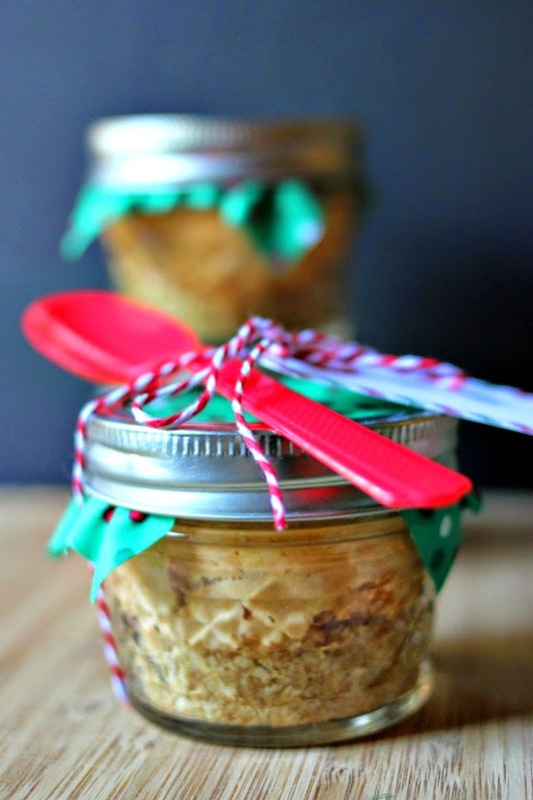 Grab clean mason jars- the mini jelly jars make adorable little gifts. 2. Scoop graham cracker crust mix and put a small amount into each jar, if using the mini jars, a table spoon is more than enough and then use the back of the spoon to pack the crust into the bottom. If you wear gloves, you can do this with your fingers. 3. 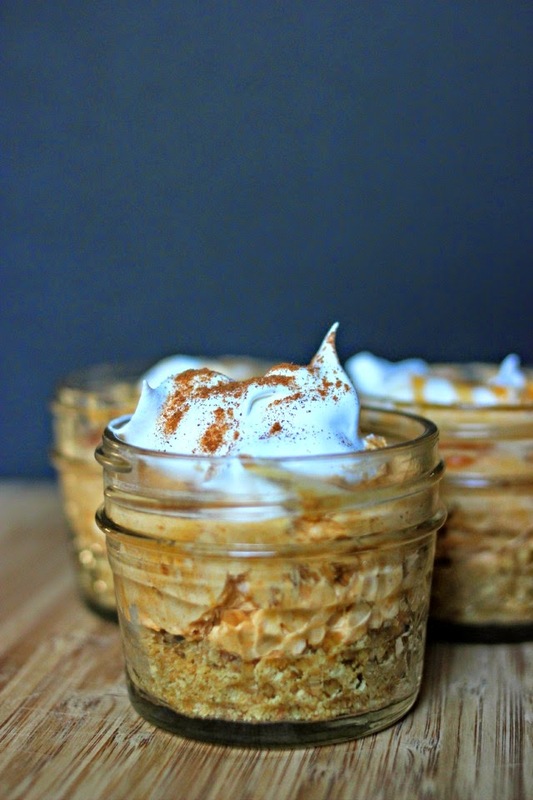 Then fill each jar with the pumpkin cheesecake filling. Leave enough room for the Cool Whip (if using) topping/garnish. I used a spoon which made it a bit ... messy looking and I had to use a paper towel to clean the inside of the jar to make them look neater. I would suggest putting the mix into a large ziploc bag and cut a corner and pipe it into the jars or if you have a frosting bag, go that route. 4. Allow the cheesecakes to sit in the fridge at least three hours. Optional: Top each with Cool Whip and sprinkle with cinnamon or caramel drizzle. Go and make someone's day! I did make the cheesecake filling the night before assembly and it worked out wonderfully! It tastes AMAZING! You can find all your ingredients at Walmart. Do you make edible gifts for friends, family or neighbors? Which are your favorite to give or receive? There's just something about edible gifts that make my heart melt! They're cost effective, they're from the heart and spread smiles all around!